What you might not be doing (but should be) on social media in 2018. 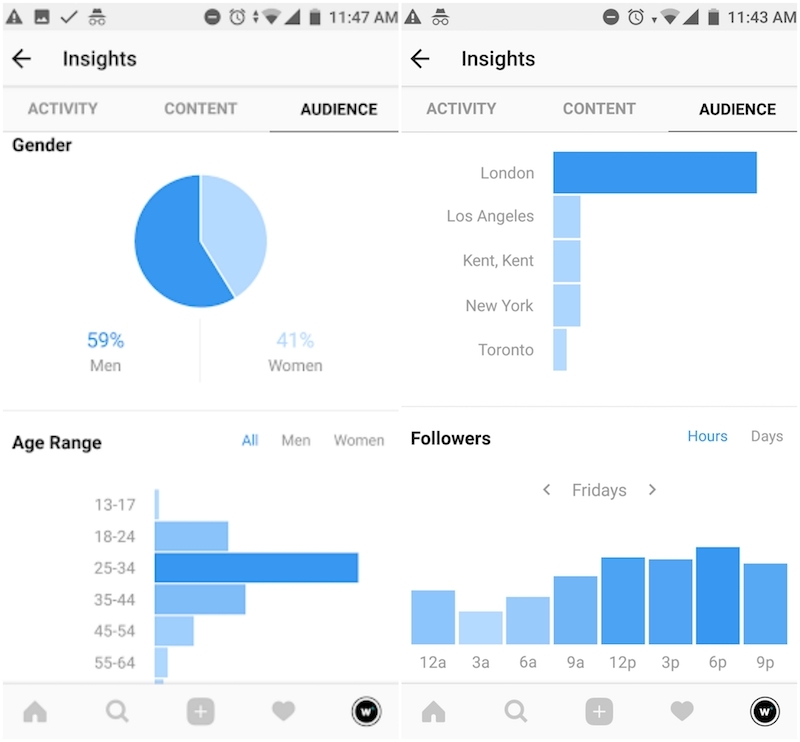 Showcase your very best content on your Instagram profile’s highlight reel, because sometimes your Instagram story is so good that you just can’t let it go. Instagram highlights allow you to have your best stories pinned to the top of your profile, allowing for maximum exposure. The highlights are a great way to promote anything about your business, whether that be products, vlogs or even use it just to promote your brand’s values. Talk to us about Instagram Marketing! Influencer marketing isn’t anything new, but it’s for sure still gaining momentum this year. One study of the #ad hashtag on Instagram found that influencer marketing grew by up to 198% in 2017. All sponsored posts now have to be transparent about being sponsored and Millennials are considered to be more likely to take product recommendations from peers like bloggers and Instagrammers now because of a higher perceived authenticity than with celebrity endorsements. 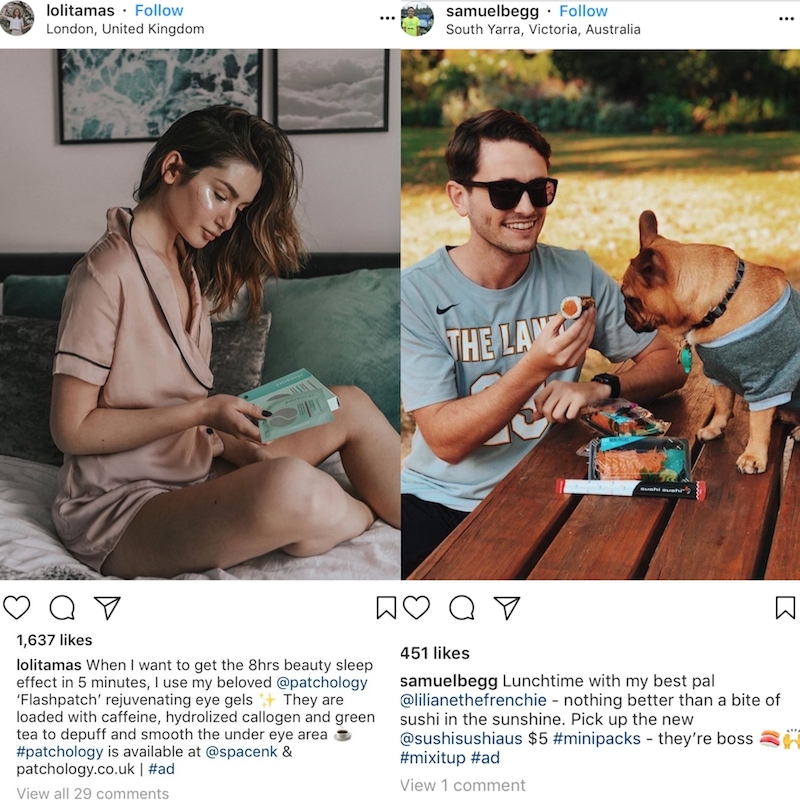 Micro-influencers can be found in any sector, and would usually be those with a following between 10,000 and 500,000 but will have a significant level of engagement on their posts. This type of marketing takes advantage of an existing trust relationship between the influencer and the audience that they have built. The reach of these influencers is much lower than using a celebrity, for instance, but ultimately the impressions made will be far more valuable as the influencer’s audience have shown themselves to potentially be interested in the brand, based on the influencer that they follow. Statistics are starting to show a trend towards this style of marketing, as consumers are more trusting of a social media reference than they are a celebrity. A joint study by Twitter and analytics firm Annalect even found that around 40% of respondents said they've purchased an item online after seeing it used by an influencer on social media, showing the possibility of great revenue from this kind of marketing strategy. We can help you with influencer marketing, contact us here! The social media analytics tools at our fingertips are more sophisticated than ever before, so you can find out which of your posts are getting the most attention and who are your most influential followers across all accounts! 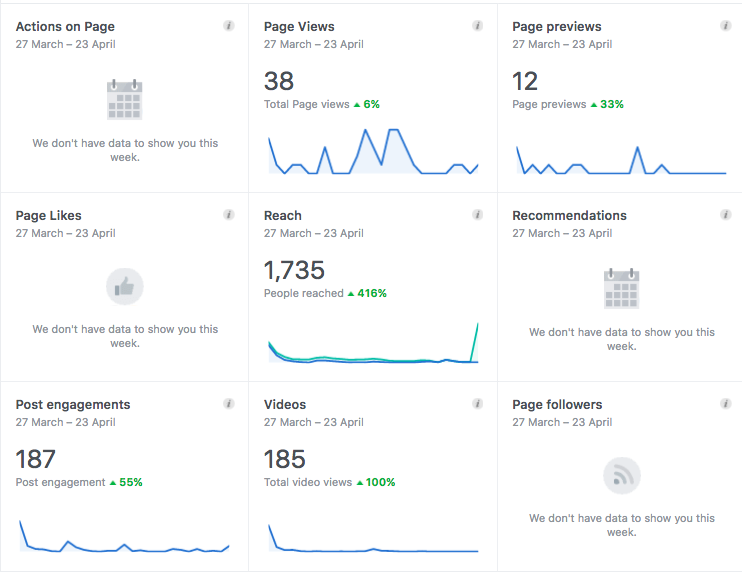 Each platform has them now but if you’re looking for stats on Facebook, Linkedin, Instagram and Twitter all in one place, most scheduling tools have these really well laid out for you in an easily digestible way. Have you tailored your posts to consider your audience? Find this dashboard on your Instagram account! Your audience are in different mindsets when consuming media on Facebook than they will be when on Instagram or Twitter or LinkedIn and your content should take this into consideration. This is why we advise clients to use each platform’s analytical tool to understand it’s audience. Don’t be afraid to test posts: timing is crucial with social media and you can find out when your audience are more likely to engage by posting comparable content at different times of the day. 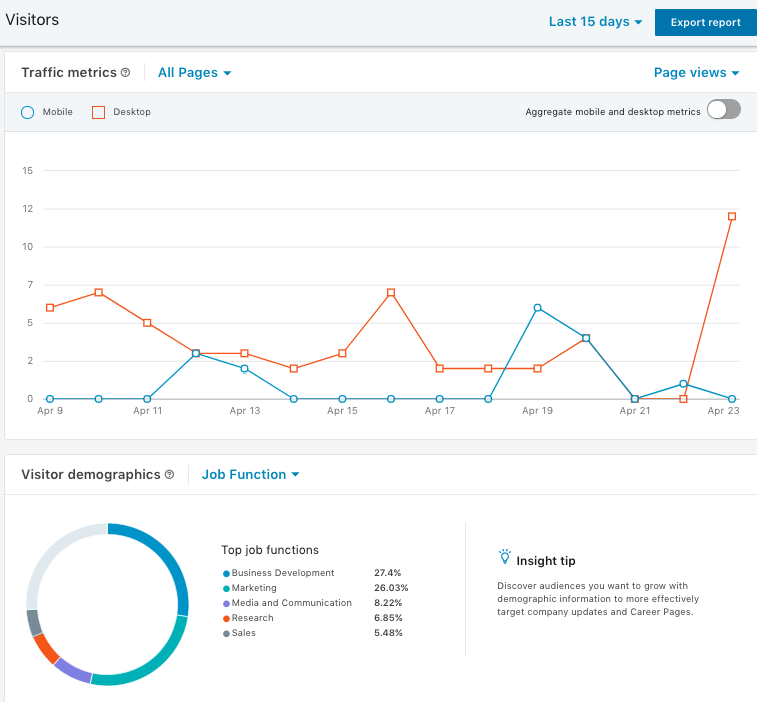 The Linkedin Analytics Visitor’s page. Find out more about using analytics, let's talk. 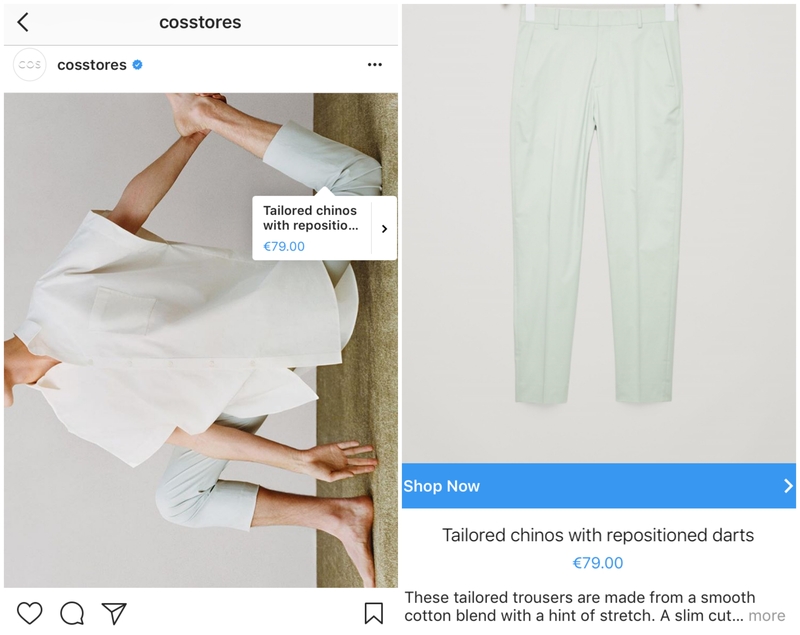 Your customers can now buy your products without even leaving Instagram, making your profile and it’s content more valuable than ever. We know the more clicks it takes for a user to convert, the less likely they’ll be to make it through the journey. So this new Instagram feature really is a gift from the social media gods if you are a business that is already leaning on Instagram a lot for your marketing efforts. All you’ll need to do is sync your product catalogue with Facebook Shop, to do this there are a number of popular E-commerce platforms that you could use, including the likes of BigCommerce, Shopify or WooCommerce. Want to know more about Instagram Shopping? Contact us! Content has been king for a long time, but now it’s really taking over. Facebook’s new algorithm means that organically shared posts will thrive whilst pushy promotions will fall, it’ll be a case of getting shares and likes as opposed to just getting engagements. This means that you’ll need to step up your game and get people talking when it comes to what you’re posting on this platform going forward. You should be thinking about posts that will make your user want to engage: so this could be things like comedic posts if it suits your brand (e.g. memes and GIFs), this could also mean that you start talking about the industry and recent industry news, or maybe you'll write your own blogs and use those of others too. Having your business on social media isn’t about directly leading users to a sale, it’s about entertaining, educating and motivating your followers. You should aspire to create content that your audience WANT to see in order to capture their attention and use that attention to create a longer lasting relationship between your customers and your brand. It’s all about the chat! Brands who engage with their users on a more personal level will thrive in the new world of social media. It’s all about building a relationship and engaging consistently with your customer base so that they want to engage with you too. Maybe think about how you can respond to user comments or tweets in a fun way that could even be shareable, we love to see brands not taking themselves too seriously! Check out some examples that we love here! 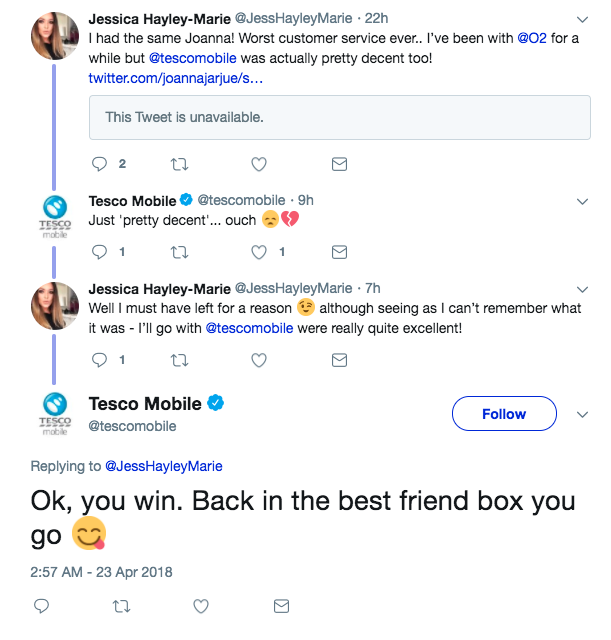 Tesco Mobile are known for their human responses. Netflix are also great at bringing in the banter. Let's chat about how to speak to your customer online. This artificial intelligence led tech speaks with consumers and helps them to choose products, answer frequently asked questions and provides customer services beyond purchases. Their popularity is skyrocketing this year and it’s becoming the quickest and easiest way for us to get the answers we need about a company or it’s products, some big names are seeing great success through chatbots, including the likes of ASOS whose orders increased by 300% using Messenger Chatbots or like Sephora who increased their makeover appointments by 11% via their Facebook Messenger Chatbot. If you’re not already, this is definitely something to consider in 2018. Find out more about chatbots, arrange a call! We are starting to care more and more about what brands are doing to help contribute to social efforts. Brands will be more likely to make sales, especially to millennials, if they have a proven track record of supporting causes. CSR means taking steps towards being more sustainable and socially aware in the same breath as improving public image, it’s a win-win for brands so you should be thinking about what you could be doing. For more on this subject, read our blog on the biggest hits and misses of CSR campaigns of the past few years. Get in touch today to discuss how to make your social media work for you! We will only use your email address to contact you regarding a 15-minute no-obligation consultation with our Director to discuss your marketing challenges. LinkedIn for business and Facebook for personal... is it really that simple? When to use LinkedIn and when to use Facebook for your Business and Networking. What's the point of social media? Should I be posting content on my website or social media? This is a question I’m frequently asked by clients, and the answer is surprisingly straightforward.